What is a Feedback Rubric? 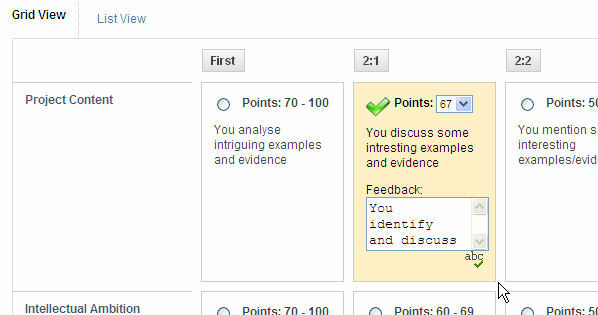 In Blackboard, a Feedback Rubric is a tool that displays the assessment criteria for an assignment. Feedback Rubrics can help students understand what is expected to meet the requirements of an assignment, and can be used by instructors as a marking tool to demonstrate to students how they met each criterion. Feedback Rubrics can also ensure that marking is consistent and impartial. In other words, Feedback Rubrics can be described as interactive marking grids. Feedback Rubrics are made up of rows and columns. The rows correspond to the various criteria of an assignment, while the columns correspond to the level of achievement expressed for each criterion. A point or percentage value for each cell in the Feedback Rubric defines the evaluation and score of an assignment. Feedback Rubrics can be attached to Assignments and other grade columns in the Grade Centre. Blogs, Wikis, Discussion Board threads and forums, and Essay and Short Answer Test questions can also have Feedback Rubrics associated with them. Feedback Rubrics can be copied and re-used on different assignments and exported across multiple Blackboard sites. A ‘standard’ Feedback Rubric could be created that covers the same criteria across similar assessment tasks. This can then be shared and associated with those different assignments in order to save time in repeatedly typing the same information each time a rubric is created. When a Feedback Rubric has been associated with an Assignment or other grade column, it can be used for grading and to provide feedback to students. For each criterion, select the cell that corresponds to that student’s level of achievement; you can enter or select the relevant point or percentage value, and you can enter feedback to the student in the text box that appears when a cell is selected. A running Raw Total is displayed as each criterion is graded – which can be overridden – and an overall feedback comment can also be included. When marking is complete, students can access their individual graded Rubric via the My Grades link in the Blackboard site. How do I associate a Feedback Rubric with an Assignment or Grade Centre Column? How do I grade and provide feedback using a Feedback Rubric?